Published on 23 April 2007. There’s been much comment recently about politicians reaching out to the ‘yoof’ vote through sites like YouTube, and Labour’s” frameborder=”0″ allowfullscreen> embarrassing efforts thereon. Why is it that politicians believe that they can reach a politically disaffected youth by doing old things via new media? The problem isn’t that teenagers don’t want to see a speech by Tony Blair on TV, it’s that they don’t want to see a speech by Tony Blair. Sticking it on YouTube doesn’t help. 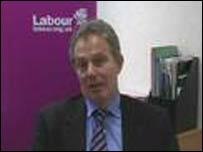 It’s a lot like Blair’s idea to woo the MTV generation by appearing on, erm, MTV. That, too, was a bizarre idea. People watch MTV for The Osbournes, not for a party political broadcast. The medium is unimportant – if The Osbournes was broadcast via YouTube, it would be as popular as it was on MTV. A party political broadcast is as unappealing on YouTube as it is on the BBC. It isn’t the medium politicians are getting wrong, and trying to hijack a medium won’t get far. The (relative) success of WebCameron comes from the fact that it does things differently. It allows users to post videos like this without complaint. It engages (albeit somewhat reluctantly) with the blogosphere’s proclivity for awkward questions. In short, it allows people to disagree, mock the site and the system, and hence engage in something resembling a two-way conversation (however staged and controlled it is in reality). That’s why Labour, who are stuck in the Blairite era of tight media control can’t hack it. They fear nothing more than discussion, debate, and a news cycle with a life of it’s own. So they can’t engage with a youth currently obsessed by the idea of the democratisation of the media. Prepared speeches and crafted videos have no place and hold no interest for this youth, whether on YouTube, their iPod, or the BBC. One of the great historical strengths of British politics has been the administration’s ability to do almost anything it likes for four or five years, after which they will be judged by the electorate. As the electorate becomes more connected, and the sharing of ideas takes hold, then we enter a new form of democracy, where politicians are judged constantly, and opinions are constantly formed and reformed. And that’s the real message. People want to be heard, consulted, and involved – through any and all media. The political game has reached a tipping point, and however you disguise old-style politics, it just won’t cut it in the brave new world. This 1,107th post was filed under: Politics. Trackback received at 09:02 on 10th September 2007.